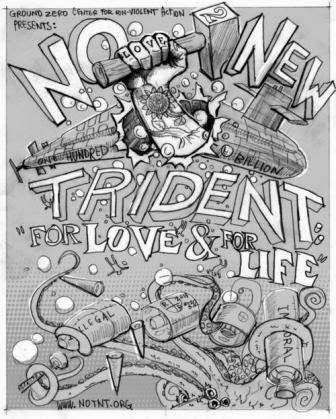 NO To NEW TRIDENT - For LOVE & For LIFE: Trident, Jobs AND Transition... or, Moving The Money!!! Trident, Jobs AND Transition... or, Moving The Money!!! Every community should have sustainable, long-term, good jobs now and for the future. Every level of government has a role to play to make that become a reality. That statement opens a July 2nd Opinion piece in the Milwaukee Journal Sentinel about transitioning from an economy dependent on "defense" jobs to a local and sustainable economy. Although this opening does not mention the role of citizens in this process, the article makes it clear that local citizen engagement is key to making transition work. Whether tanks or Trident, the essential process is the same in terms of local, citizen engagement in the process. 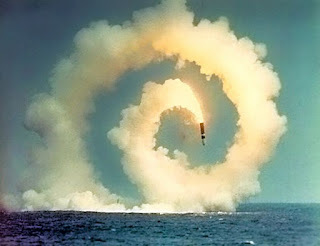 Of course, in the case of Trident, we have a very steep hill to climb. There is no lack of funding to keep the Trident nuclear weapons system functioning 24/7 patrolling the seas ready to launch its Trident II D-5 missiles bristling with thermonuclear warheads at any location on the globe. Therefore, the local economy is well stimulated by nuclear weapons spending, and there is little incentive to change. Just here in Kitsap County, tens of thousands of people depend on Trident to support themselves and their families. It will require a significant paradigm shift in our thinking about nuclear weapons to enable us to consider the utility (or lack thereof) of the Trident nuclear weapons system and ultimately make the important transition to local, civilian, sustainable economy. What might the land where Naval Base Kitsap-Bangor and Strategic Weapons Facility, Pacific look like in a future without Trident? What local, sustainable industries might this valuable land bordering Hood Canal support? How do we create the critical paradigm shift so necessary to create an opening for abolition and ultimately a local, sustainable economy??? The oped is the prelude to the efforts to utilize the Office of Economic Adjustment grant in Oshkosh as a public engagement opportunity on defense industry transition. The author participated in the Move the Money training conducted by Peace Action and National Priorities Project and is a part of the core organizing to develop a statewide strategy on defense industry transition. It will also be printed in the Capitol Times in Madison and reprinted in a regional labor publication. The oped and the planning underway in WI coming out of the Move the Money Training is an example of how relationship building, a proactive response to a local jobs crisis and a national effort to begin to answer the question what comes next when we do succeed in cutting the Pentagon budget come together. The next steps are being discussed: possible referenda, building support for a bi-partisan support for a state bill to establish "defense transition" commission as well as continued public education through local events along side of bird dogging during the midterm elections. The layoffs at Preisler's plant were not from cuts to the Pentagon budget. They were due to contracts ending from the Afghanistan and Iraq wars. But it shows how we can join with labor now to plot the steps for a just transition from dependency on defense contracts for good paying union jobs to a local sustainable economy. When it comes to the hundreds of billions of dollars spent on Trident and the hundreds of billions to be spent on New Trident, is this money spent on weapons intended (by their very design) for omnicide a good investment??? May we, as citizens join together to say NO To NEW TRIDENT and YES to LIFE and LOCAL, SUSTAINABLE ECONOMIES!!! Doom from the Depths: Coming Your Way!! !